The world inside George R.R. Martin’s “Game of Thrones: A Song of Ice and Fire” is as big as it is bloody. Comprising of thousands of characters and hundreds of Houses, both great as well as small, Game of Thrones has managed to attract millions of fans all around the world. Anyone who has watched “Game of Thrones” or read “A Song of Ice and Fire” knows about the Great Houses’ monopoly on Westeros. They rule over the Seven Kingdoms of Westeros and make sure to wed their daughters with sons from other Great Houses, so as to ensure their dominance over the whole land. Therefore, the family trees in Game of Thrones are really complicated. Almost all the Great Houses are inter-linked somehow and visualizing all of them as one big tree is one hell of a task. 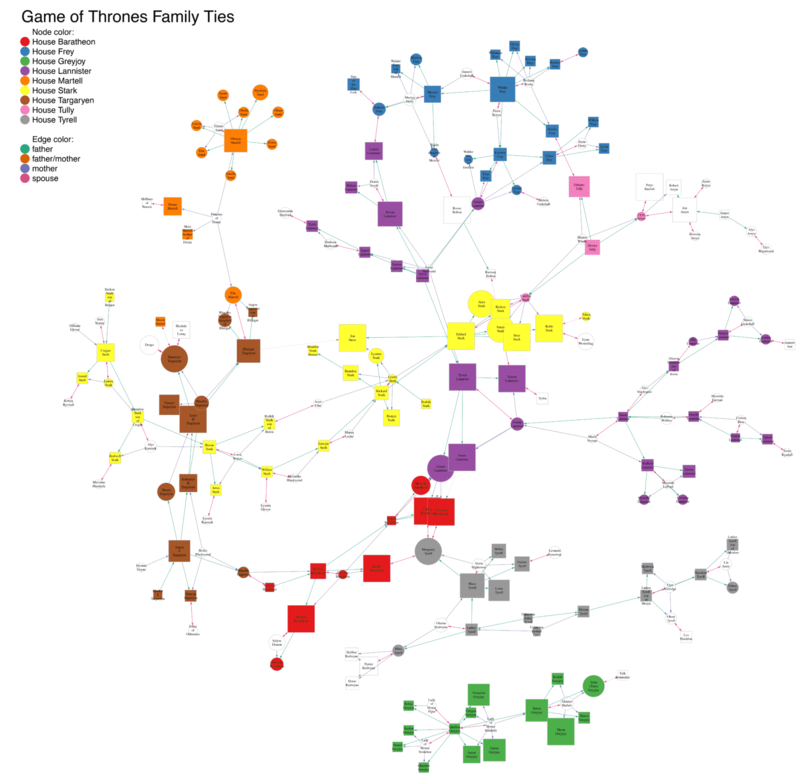 This project, by Shirin Glander, uses Network Analysis to explore relationships in the world of Game of Thrones. This technique is commonly used to explore relationships in social or professional networks. Shirin scraped information about the families from the Game of Thrones wiki and added the missing information by hand. She also used different edges (links between individuals) to indicate a relationship that has been hinted by the TV series, which differs slightly from the book. You can get more details about the project over here. Death may be a reality in real life, but in Game of Thrones, it’s everywhere. You simply can’t go a few chapters (or a few episodes) without a few of your favorite characters dropping dead. Considering George R.R. Martin’s obsession with killing the most loved characters on the show, it’s really astonishing how he still manages to shock people in the manner he does it. This project, by Shubham Agarwal, uses Machine Learning to detect possible patterns in the deaths of characters in Game of Thrones. Machine Learning, a form of artificial intelligence, is used to detect hidden insights through learning from historical relationships and data trends. Is there a relationship between survival and number of dead relatives? Does appearing in more books relate to survival? Does belonging to a noble family make you prone to death? 3. Which characters are most likely to die? Did you know that out of the 916 named characters that inhabit the world of GoT, nearly a third of them have died? And that’s only the ones who are named in the series. So, it is no wonder that everyone wants to know which characters will survive the next book and which won’t make the cut. This project, by Allen Downey’s students, uses Bayesian Survival Analysis to predict which characters are likely to survive and which might die in the forthcoming books. Survival Analysis is commonly used to estimate survival rates in clinical research. Note: This project was posted after the fifth book but before the fifth season, in 2015, and uses data from the first five books. Even if Jon is still alive at the end of book 5, the odds that he will survive the next two books drop to between 30 percent and 51 percent. Probability of Survival: 90 percent credible interval for Arryn (Blue), Lannister (Gold), None (Green), and Stark (Grey). The number of male characters in GoT is nearly 5 times that of female characters. The interesting thing is that the odds of surviving are way higher for women than it is for men. Lannister noblewomen are a little more likely to die than the Starks. Tyrion and James, the Lannister brothers, have approximately the same chance of survival for the next few books. Game of Thrones is a global phenomenon and its following is huge! During the days when the show is on, social media is littered with everything from spoilers and reactions to rants and mourning, making the show almost unavoidable. This project, by Luiz Maykot, used Adobe Social to measure roughly six million social mentions related to Game of Thrones and their characters across social media platforms. People hate Sansa and Brienne of Tarth, both of which are at the bottom of the positive sentiment charts. As expected, Jon Snow rocked the show with the most mentions. The mother of dragons, Daenerys, was not far either. The finale wasn’t as good as everyone expected it to be — average sentiment was higher before it than it was after it. The stars of the finale? Jon Snow, Cersei, Stannis, and Death! Ki maqsad c iss post da. ?